Professor S.K. Gupta (ME/ISR) and students from his Simulation-Based System Design Lab and Advanced Manufacturing Lab recently gave a demonstration of bio-inspired robots at the Kensington Park Library in Montgomery County, Md. More than 230 people came to the event to learn about Robo Raven, Robo Crab, Robo Terp and the SCALE Bot stair-climbing robot. 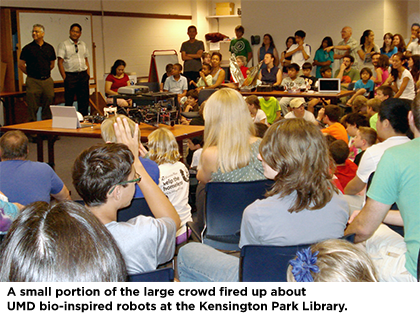 The event was very exciting for the children in attendance, many of whom now want to come to the University of Maryland to study robotics when they grow up!